She's a beauty. This is the grounding for a 150A 120/240 1Ø lighting service I saw today. Is that thing coupled to a TOWN-GAS pipe??? Please tell me this is not in my city!!! There isn't a great deal of contact in this Grounding system. 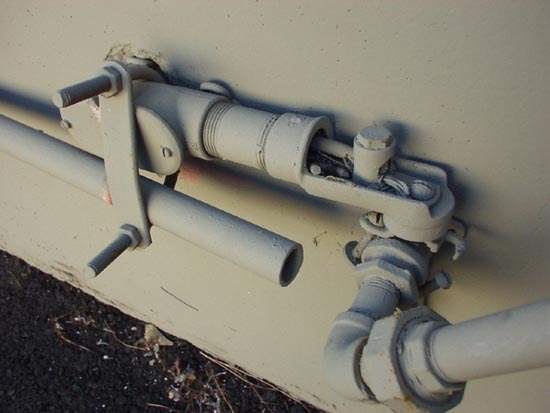 From what I can see, the clamp around the pipe and LB, is just sitting there, with a gap you could drive a car through, between the metal surfaces, you can tell the clamp has moved since the painting took place. Are those sorts of clamps allowed to be used for Electrical connections?. Also, around that (Gas?) pipe, I see that one side of the clamp is busted, so there ain't going to be much contact there either. Add, into the equation, some idiot with an Airless spray gun, and the whole thing is pretty much a waste of time. BTW, Scott, is that receptacle rated for exterior use?. Is that a wire between the LB and the wall?. Please tell us there is bonding elsewhere!!! I had a tough time figuring out wat it was all about when I was right there looking at it, and I still don't know. A 3/4"x ? 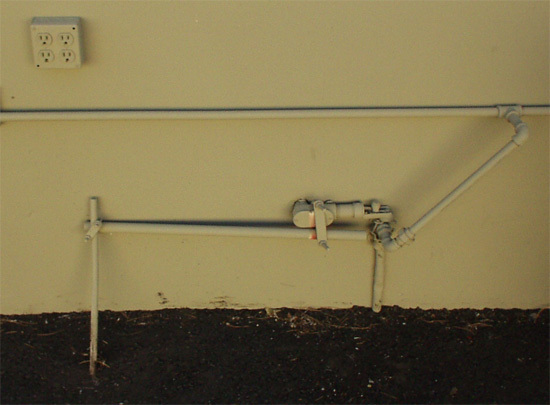 ground rod on the left connects to an empty galv cond (or plumbing pipe) via the hardware store U-bolt. The other end of the pipe is just hanging there in the other U-bolt "bonded" to the SLB. Actually that is a water line, but it doesn't do a lot of good with the clamp disconnected. The clamp, btw will not fit around the plumbing fitting, it's too small. Links of chain are stuffed behind the SLB for ??? An indoor non-GFI receptacle installed outdoors, yet another coat of paint, and Voila! Larry this is not your city, but close to it. Looks like the original GEC installation may have been done properly...its even in ridged for protection. Then maybe the owner read some do it yourself book and saw that a ground rod was required now and tried to do it himself.He put the chain links behind the LB to get space for the U bolt install.Then maybe the painter stepped up on the assembly to reach something above and the clamp broke away from the water pipe...whatdayathink??? I believe the slb, etc., were installed with the original service as the water bond (to drain stray elec from water piping). At some later date, someone decided to 'ground' their system, and took the shortcut of attempting to tie a "gec" into the water bond, using the u-clamps. If so, this shows a basic mis-understanding of the purpoese of the two systems.